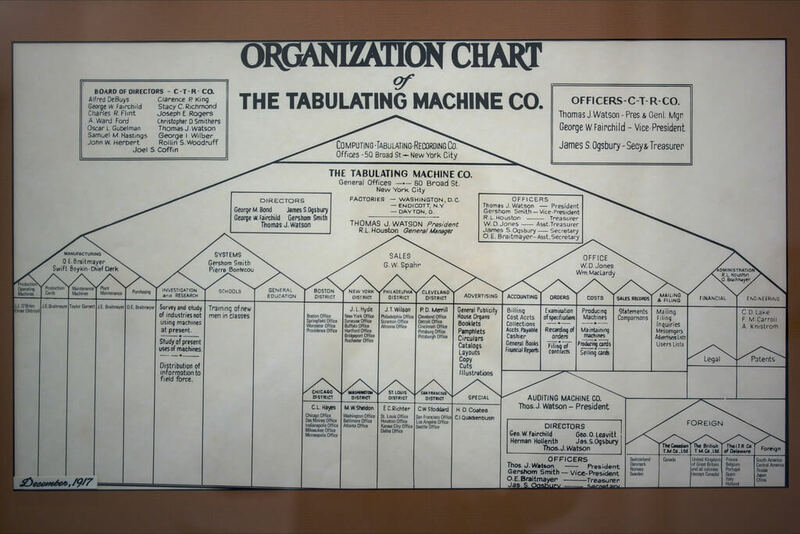 A functional organization (also called traditional or classical organization) is the most common form of organization structure where staff members are grouped by specialty, such as engineering, manufacturing, operations, human resources, and finance, and perform similar functions. Each department in a functional organization does its project work independently of other departments. Functional organizational structures are used for businesses that produce and sell standard products, or in other words, do mass production of goods. In a functional organizational structure, resources are grouped into functions or departments according to their area of specialization. Each department or function focuses on technical excellence and cost competitiveness in order to support the company’s business goals. For example, a large automotive company may have several functions such as Product Development or Engineering, Manufacturing, Sales and Marketing, Information Technology. Within Engineering, it may have departments for Engines, Transmission, Powertrain, Chassis, Body, Electrical and Electronics Systems, etc. Engine Engineering department may have sub-departments for Manual Transmission and Automatic Transmission Engines, and so on. Another simple way to understand functional organizational structure is to think about the departments in your university or college. The faculty in the Science department only teaches science, the faculty in the Mathematics department only teaches Maths. They specialize in their own discipline. Another analogy can be drawn with government departments. Most governments have departments for revenue, foreign affairs, education, public services, health etc. These departments usually function in “silos” and all communication and coordination is channeled through the top officials overseeing these departments. Yet another example is armed forces - Army, Navy and Air Force - have very hierarchical and rigid structures. Keep these examples in mind when you think of a functional organization structure. 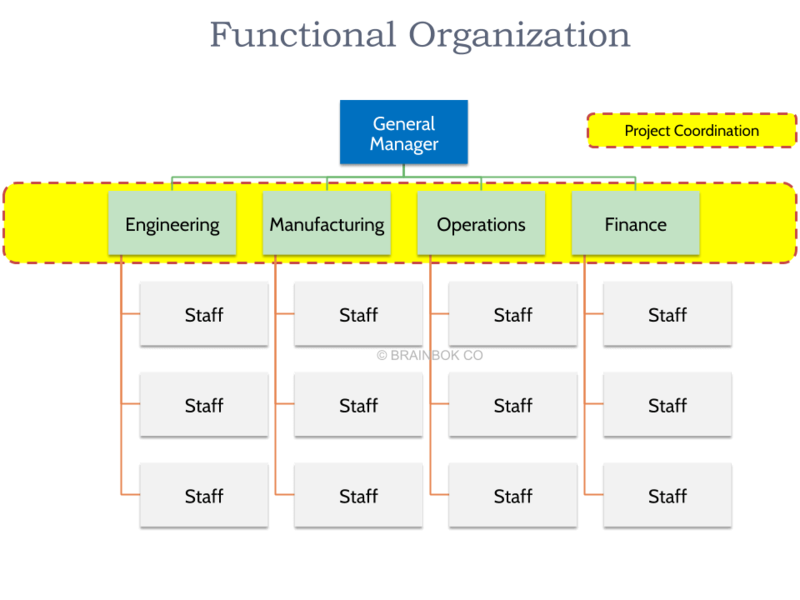 Do Functional Organization have Projects? Yes, projects do exist in functional organization. However, Project Manager’s role is very limited in a functional organization. Project generally run within a single department and the department manager is the one who is fully in charge of the project and controls the project budget and resources. The project manager reports to the department manager and has little or no authority over the project team members, who report to the department manager. A company may also form a project team to take up key organization-wide initiatives such as cost reduction by improving design and manufacturing efficiency, implementation of a new corporate IT application, set up of a new plant, etc. To drive such initiatives, a cross-functional project team may be formed with resources pooled from different departments. These resources are usually assigned part-time to the project and continue to perform their regular functional duties while they work on the project. A project manager can be appointed from one of the functions or it could be one of the functional heads. In such a structure, the project manager may not have authority over the project team members because the team members continue to report to their functional managers. When conflicts arise on the project, they are usually reported up the management hierarchy and resolved through the intervention of top executives or department heads. Decisions are usually made in favor of the strongest department. Even if the project manager is given decision-making authority by a top executive, decisions may favor the project manager’s own department, rather than the interests of the company as a whole. Since Project Managers do not have power or authority to make decisions in a functional organization structure, they must rely on their leadership, negotiation, persuasion, networking, and other soft skills to gain consensus, resolve conflicts, and get the work accomplished in order to meet the project objectives. No duplication of effort as each department focuses on one function. More flexibility in staff allocation and budgeting for projects. Well established communication channels (vertically). Better management of specialists as the departments are organized by areas of specialization. Employees have a clearly defined career path in their area of specialization. - They have opportunities to move up the hierarchical ladder while gaining expertise in their discipline. Better utilization of scarce resources. Clearly defined reporting structure. Each employee has one boss. Employees perform repetitive work and gain expertise in their discipline. Employees in a department share similar knowledge, education and experience, so they can learn from each other and further hone their skills. Projects are usually completed within cost. Now you may ask why bother about other organizational structures if a functional organization has all these advantages. Well, for each positive, there’s a downside too. We’ll review those next. Departments operate in “silos” and communication among departments is inefficient and slow, leading to slower decision making and problem resolution (more red tape). No ownership of the projects - no central authority or individual responsible for the projects. No customer focal point – slower response to customer needs. There’s stronger allegiance to the function than to the project or the customer. Organization wide changes are harder to implement as it’s difficult to get all functional departments to collaborate on organizational goals. Decisions are made in favor of the strongest department. Poor horizontal (departments-to-department) dissemination of information. This makes communication and collaboration on projects extremely challenging. Functional units or departments do not always cooperate well with each other. Teamwork and collaboration with other functions is not promoted, and there is little or no cross pollination of ideas. While projects usually deliver within costs, they usually tend to fall behind schedule because integration of project activities is difficult in a functional structure as priority is given to the interests of the functional departments rather than those of the projects. Duplication of effort can occur on department-centric projects. From my own experience with such organizations, different departments within the same company hire their own IT staff to build very similar systems to those in the other departments. This results in waste for the organization as a whole. Since the nature of work within the departments is repetitive, employee morale and innovation may suffer. Organizations with a functional structure tend to be slow in responding to competition and change in market conditions. More involvement is required from upper management because of conflict arising from struggle for power among the functional units, and due to customer complaints. There is no clearly defined career path for project managers in a functional organization. When it comes to the PMP exam, functional organizations are usually painted in bad light because they tend to give less authority to project managers. If the organizational structure is not mentioned on a PMP exam question, you should assume a Matrix Organization (I’ll do a future post on other Organizational Structures). Functional organizational structure is used for businesses that mass produce goods with a focus on cost-effectiveness. Such organizations tend to lack customer focus and are slow to respond to competition and market changes. Communication channels are clearly defined vertically but there is little horizontal dissemination of information. Departments in such organizations tend to operate in “silos”. Projects usually take place within a single department, and Project Managers have little to no authority in such organizations.